Wow! I really don't know how you do it Pamellia but you come up with something spectacular every time you post!! This card is out of this world!! I love the colours!! Although I'm a traditional girl where Christmas is concerned, this card has just knocked my sox off!!! So dramatic and so totally beautiful!!! I've stayed away from snow on my cards this year because we're in the middle of summer down here at Christmas time, but I think I'm going to use it again next year because I so love the look of the snow on your cards!! I am in love with Dolly P. How gorgeous is she?? Cannot believe that tail .. so beautiful!! Really, I am in love with all of your little friends. They are all so adorable and you capture them so beautifully with your camera. Thank you for sharing and giving us a little taste of their world. What a stunning piece Pamellia..gorgeous papers,FABulous design and love the red and all the wonderful details..I love your new friend Dolly P too, saying her speech..lol..so cute. Pamellia, you never cease to amaze me! The card is beautiful! I'm sorry the snow didn't last longer but it's a good sign we're going in the right direction. 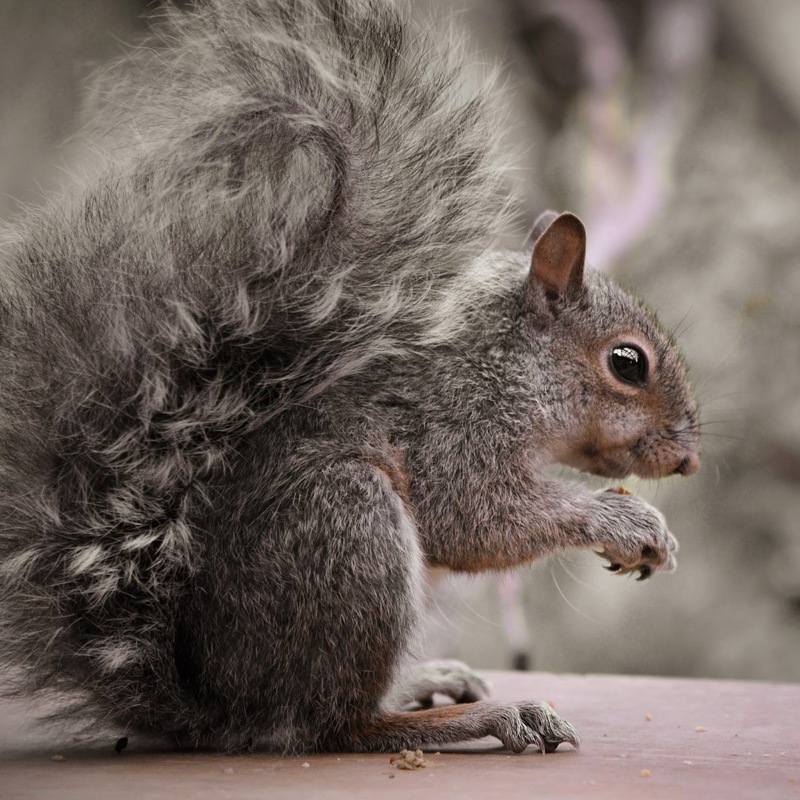 That sweet baby squirrel is adorable as are all the animals. Amazing details on the frost, too. So, so stunning! I love the black, white and beautiful pops of red - this will be a real mantlepiece pleaser for sure! The design is wonderful! Stiffer mesh..I was wondering how you managed to get such beautiful layering with tulle :D Gorgeous Christmas card! 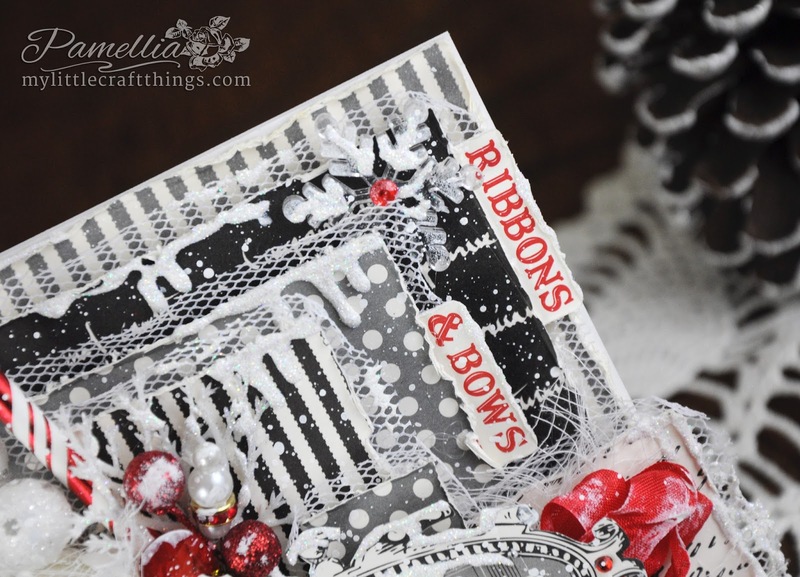 A fabulous card Pamellia, love the B/W colour combo with the red. Wonderful photos too. Fantastic colours on this wonderful card Pamellia, those papers are stunning, love how you layered up and lots of snow with glitter. Wow, what a stunning card!! I love the black, gray and white with the pops of red!! It's so beautiful!! The heavier mesh looks so fabulous!! The layers are amazing, as always!! 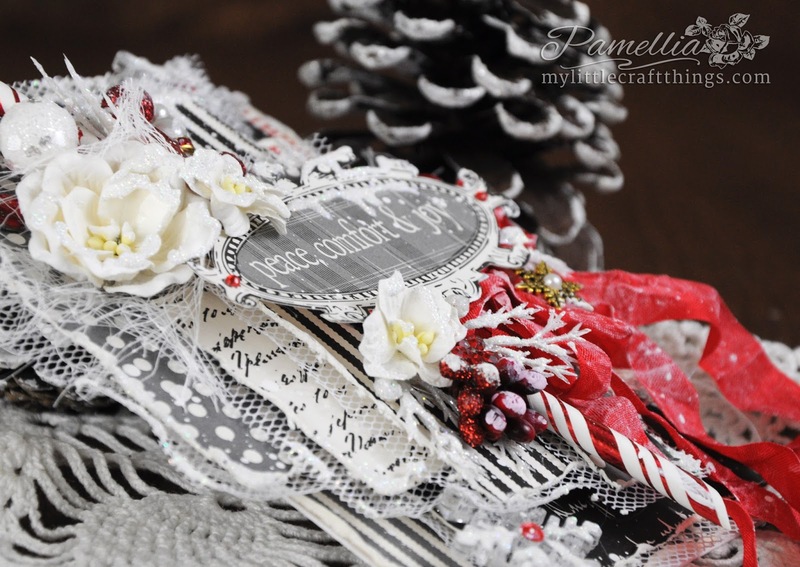 It's truly a wintry, Christmasy work of art, Pamellia!! You are a vintage queen Pamellia...it's always so much joy on your blog!!! Fabulous card and design....love it! 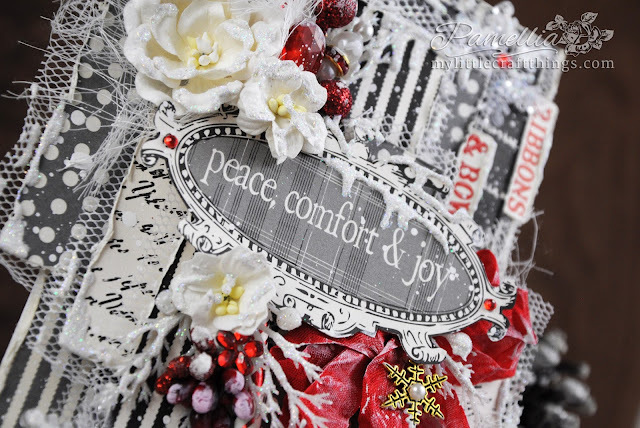 Its a stunning card, the Red bow and trims look gorgeous. Dolly P is so cute, I'm sure you will be doing all you can to help her thrive. The photos were all great. A very stylish card, with your own precious style and a lot of wonderful layers and embellishments! Love the colors combo and the plastic mesh instead the tulle looks amazing with the curled edges!! Love the big grey topper with the sentiment! Such fabulous piece of art is it!! Your photos and your words for your friends always put a smile on my face. Thanks so much for this! 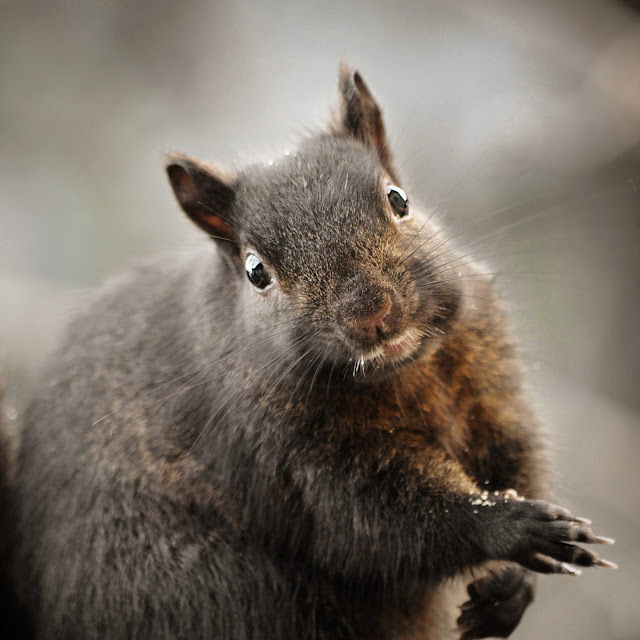 :) Dolly P. is really so tiny, hope that she'll become a bit more fat with your special diet :) She is a delightful cute squirrel, as well Missy, Rocky and The Cute Twin. Beautiful card, fabulous design and I love the bolder colours! I think the UK has your snow....not too bad here in SE but pretty heavy (for us) further north! Oh wow!!! This is gorgeous!!! Love the color combo! This looks amazing! Another beauty Pamellia.all those snowy frosty colours with that splash of warm red. Another cracker. Gorgeous pics. We have had our first bit of snow this weekend. WOW! That ice shot is amazing!! You can see the actual crystals!! Great work Pamellia!! Your card is exquisite I love the pops of red- perfect!! I Loooove your card. So many unexpected surprises just like Christmas. 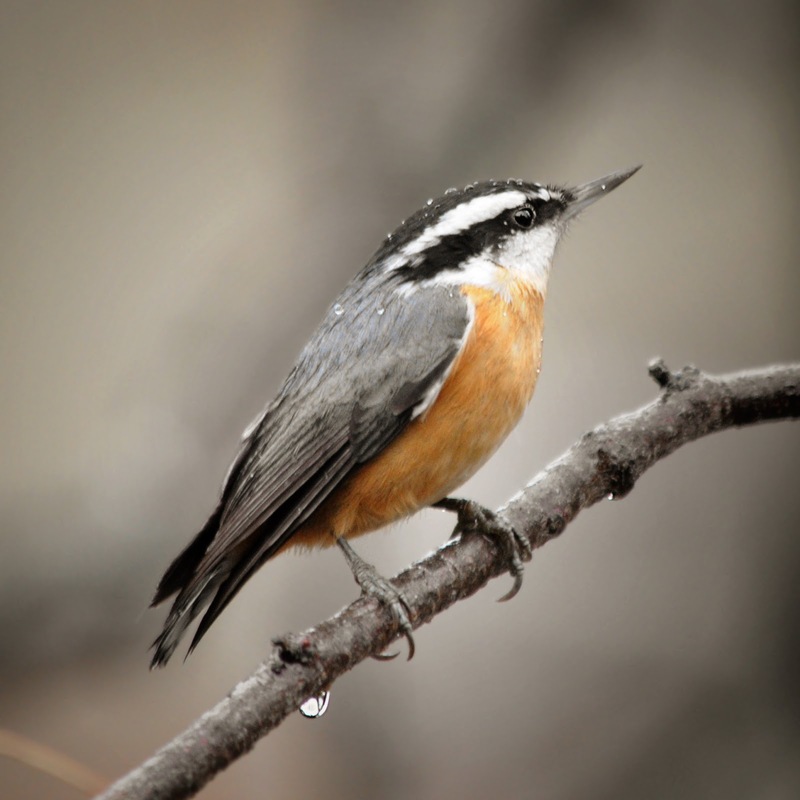 Cool bird pics Pamellia. omg Miss Dolly is too cute. Her feet are way too big for her kinda like the other Dolly's " a-hems" are too big for her. ;) te-he Youre doing great with the new macro lens.....fab shot of frost. Happy Christmas to and all the critters! 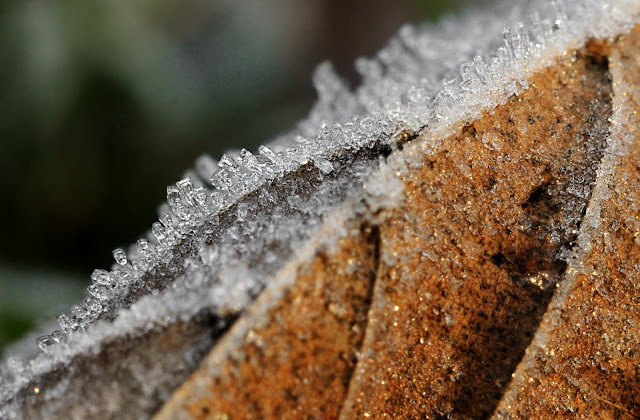 Your crystal like frost detail in your photograph complements the presentation of your card. Welll done!!! I do agree about Christmas being that bit more extravagant - it's one of the few times I crack open the sparkliness! Love your funky card, really bold and eye-catching, but with all your glorious trademark layers and dimension and general fabulousness... same goes for the photography too, of course. 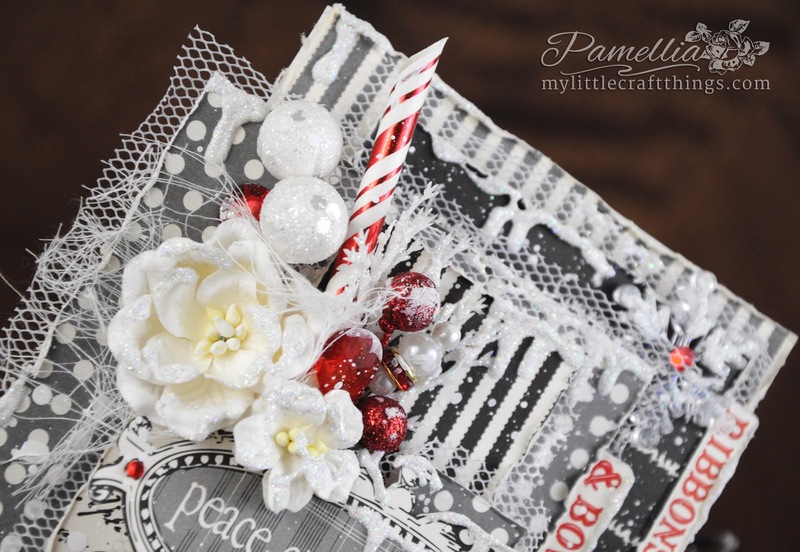 Love every shabby chic detail on your card Pamellia. Haven't popped in for a while and off to see all I have missed. Must get into doing more shabby chic as I really love it. Thanks for the inspiration sweets. Love Dolly P, hope she is still gaining weight. Oh, my, Pamellia! What a drop-dead-gorgeous card! 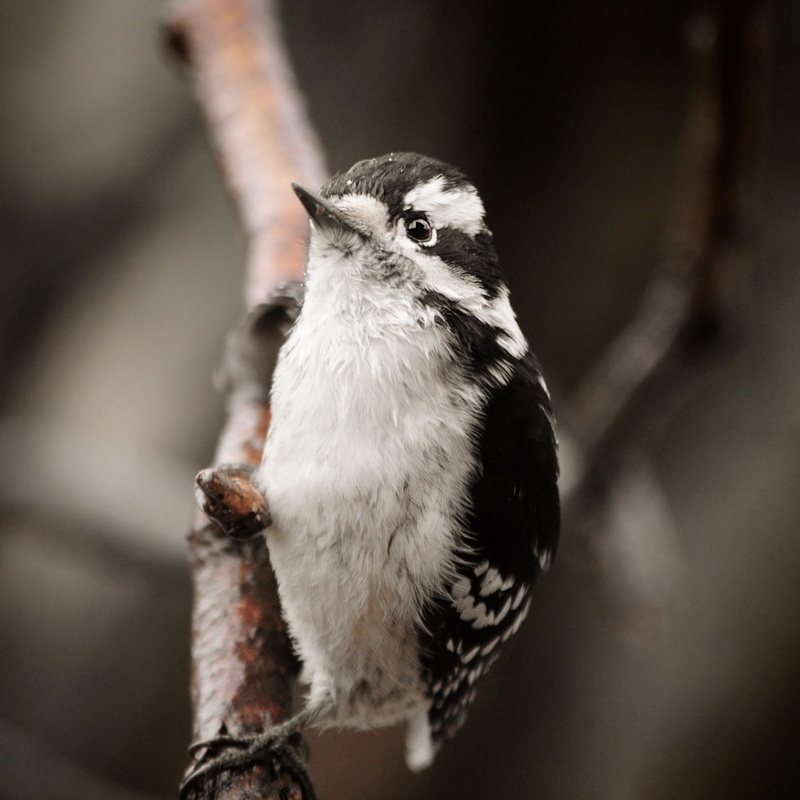 I love the black/white/grey combo with those wonderful splashes of red. Be still my heart! 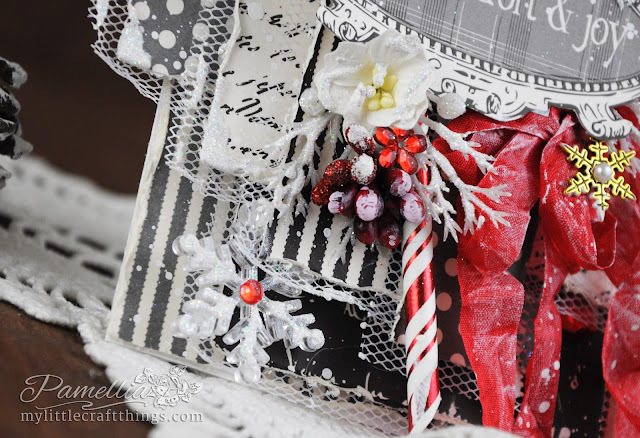 Every single last detail on this layered card goes perfectly with the next--the candy cane straw, the baubles and pins, the flowers, the greenery dripping with snow and ice...oh, I could go on and on, but oh, so short on time! Love your captions, sweetie! 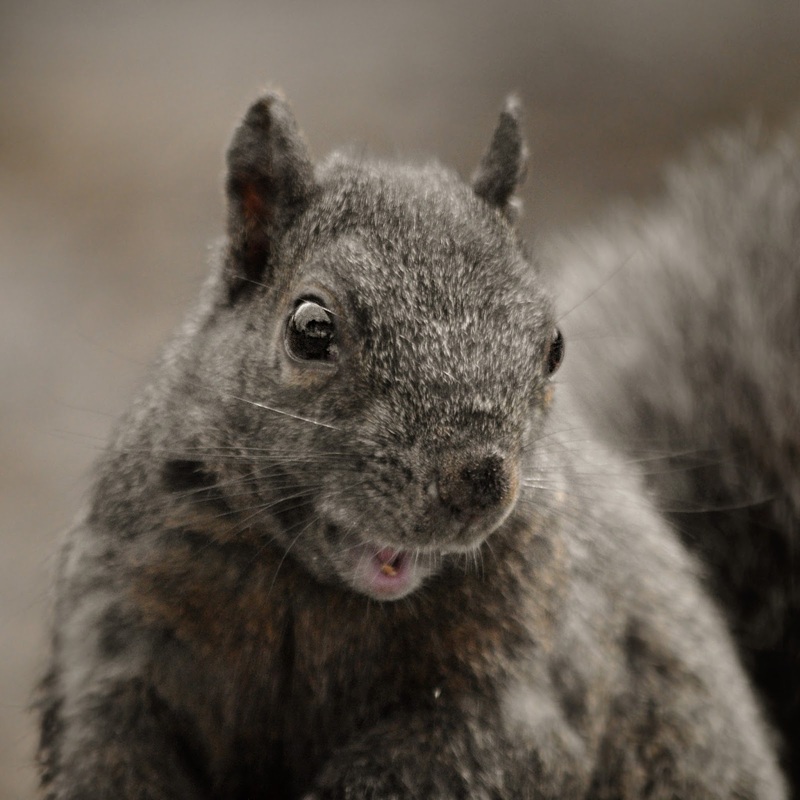 They and the wildlife that speaks such funny words make my day! 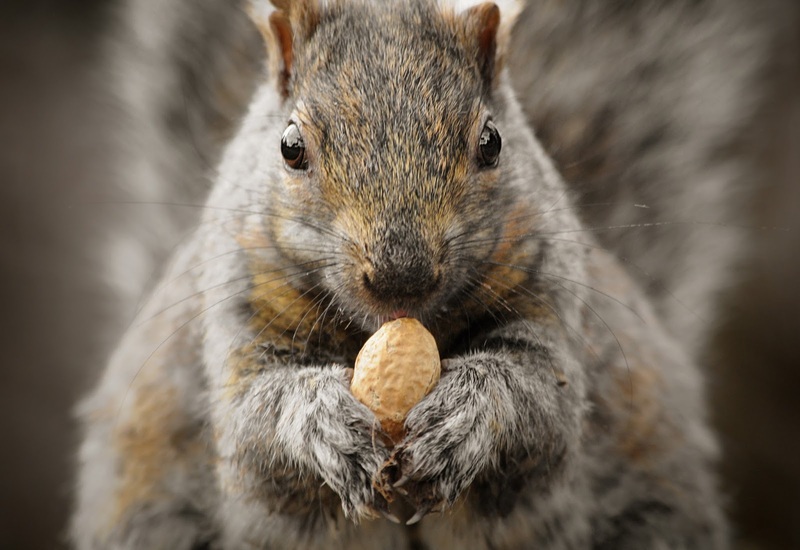 What a delicate little baby squirrel! How sweet is Dolly P! I'm sure she's going to grow under your loving care. Sending big hugs your way. We are cold here today, just a couple days too late for that dumping of rain we received this weekend. But we are in the 60's again tomorrow! I'm sure it will be shorts weather by Christmas! It will surprise me if we ever get snow on Christmas. I agree with Donna, adorable card, I love the fabulous papers and your super fun straws - they look like candy canes. Great embellishments and gorgeous big red bow. I think I have fallen in love with Dolly P, isn't she cute and what a tail.